COLUMBIA, Mo. – During the weekend of May 15-17, 5,574 students will receive degrees during spring commencement exercises at the University of Missouri. University officials also will honor researcher Susan Golden with an honorary degree. During commencement weekend, MU will award 6,185 degrees, including 4,413 bachelor’s degrees, 1,068 master’s degrees, 334 doctorates, 123 law degrees, 114 veterinary medicine degrees, 99 medicine degrees and 34 education specialist degrees. Some students will receive more than one degree. 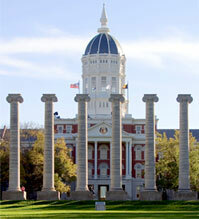 More than 350 students are graduating from MU’s online program, Mizzou Online. Students in the online program come from 32 states and three countries. Each school and college at MU holds separate ceremonies for commencement, and many invite notable speakers to address the graduates. Judge Mary Rhodes Russell, chief justice of the Missouri Supreme Court, who will speak at the School of Law ceremony on Sunday, May 17. Note: A detailed schedule of events and biographical information of the honorary degree recipient, Susan Golden, are attached. For more information on the commencement ceremonies and Columbia accommodations, please visit http://commencement.missouri.edu. NOTE: Students in the School of Social Work will participate in the College of Human Environmental Sciences ceremony. Students in the Harry S Truman School of Public Affairs will participate in the Graduate School ceremony for master’s and educational specialist candidates. The School of Natural Resources in the College of Agriculture, Food and Natural Resources will hold a separate commencement ceremony. Speaker: Stephen R. Jorgensen, dean of the College of Human Environmental Sciences. Speaker: Jerry Jaax, associate vice president for research compliance and university veterinarian at Kansas State University. Speaker: Munashe Chigerwe, MU alumnus and associate professor of livestock medicine and surgery at the School of Veterinary Medicine at the University of California, Davis. Through meticulous research, Susan Golden has made significant contributions to the field of molecular biology. Her discoveries regarding the circadian rhythm, or 24-hour biological cycle, of cyanobacteria—bacteria that get their energy through photosynthesis—reversed previously held notions that organisms with life spans shorter than one day could not maintain such “internal clocks.” The results of the study of these mechanisms have diverse implications for areas of applied research, such as the development of biofuels and improving the effectiveness of chemotherapeutic drugs. Beyond her prominence as a researcher, Golden is a dedicated mentor to her students and has received awards for her teaching. When Golden arrived at the University of Missouri in 1978, she wanted to identify the genes responsible for photosynthesis, but the discovery of circadian rhythms in cyanobacteria in 1986 changed the course of her research efforts. Instead of studying photosynthesis, Golden developed genetic tools for the cyanobacterium Synechococcus elongatus, a bacterium that lives in freshwater hot springs or other habitats of moderate temperature. Golden’s doctoral adviser at MU, Louis Sherman, now a professor of biological sciences at Purdue University, described Golden as a bright student who excelled in the lab and displayed “strength of character” as she conducted research that was “completely new to the world.” While at MU, Golden earned the Outstanding Teaching Assistant Award and the Superior Graduate Achievement Award. After completing postdoctoral work at the University of Chicago, Golden joined the biology faculty at Texas A&M, where she continued conducting genetic research on S. elongatus. In the early 1990s, Golden collaborated with C.H. Johnson at Vanderbilt University and T. Kondo at Nagoya University on a project that culminated in the only current model of a circadian rhythm in a single-celled organism. At Texas A&M, Golden led a 10-year National Institutes of Health-sponsored project to study the complexity of these “clocks” and served as the director of the Center for Biological Clocks Research, which she helped to found. Golden was promoted to distinguished professor at Texas A&M in 2003 before joining the Division of Biological Sciences at the University of California, San Diego in 2008. Her research efforts led to her election into the U.S. National Academy of Sciences in 2010. As distinguished professor at UC San Diego and director of the Center for Circadian Biology, Golden continues to study the genetics of circadian rhythms of cyanobacteria. She also has extended this research into the applied area of biofuels. Cyanobacteria are easy to manipulate genetically and grow through photosynthesis using water and carbon dioxide. These properties make these microbes well-suited for industrial use. For example, cyanobacteria are being developed to produce biofuels that could supplement, and eventually replace, fossil fuels. Golden’s colleagues have described her as a “truly delightful, generous person” and a “fine teacher and wonderful speaker” who has contributed to the training of young scientists. Golden is dedicated to promoting the development of a diverse and inclusive scientific workforce and to providing individualized support and mentoring to her trainees in the lab. As a consequence, she has been named a HHMI Professor as a leading scientist-educator in 2014. Golden has mentored more than 100 postdoctoral, doctoral, master’s and undergraduate research students. Golden earned a bachelor’s degree in biology from Mississippi University for Women in 1978 and a doctorate in genetics from the University of Missouri in 1983. She has published more than 100 publications in prominent journals, such as Science and the Proceedings of the National Academy of Sciences. Golden is also a member of the faculty of 1000 Biology and a fellow of the American Academy of Microbiology.